So Shay: Merry Christmas everyone! Hey guys! Piper and Furlee here... We just wanted to wish you a Merry Christmas!!! Dad and Mom are doing good and had a great Christmas! We all hope you did too! Oh gosh....how sweet are they?! :) Merry Christmas Shay! dawhh they are precious as can be! Are they pomeranians or chihuahuas? 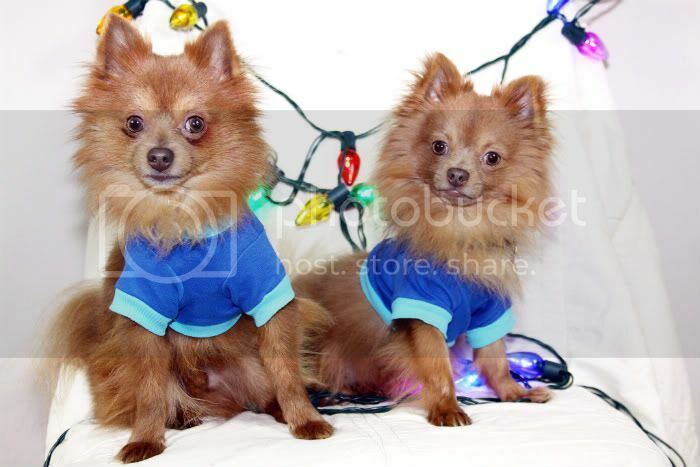 I have a pomeranian and used to have a chihuahua :) Hope you had a merry christmas! why are your dogs so cute?! Love this! Your dogs must be well behaved, because mine would never sit this long for a photo. Let alone if they had shirts and lights on them. Precious. They are too precious! Love them!! oh goodness, this is so adorable! Merry Christmas to you too! Chester and Caroline send a wag and a lick to Piper and Furlee! Adorable, as always!!! Hope you had a happy holiday and that your 2012 ahead is truly magical! Thanks for being such a lovely and supportive blogland friend!